Spirit was something in the day- he and I agreed. He was fun to show, always a crisp and spontaneous ride. His confidence improved year by year, and still, every day was a brand new day. That day, our first ride was a 4th level musical freestyle. We were at a beautiful facility in the pine-covered foothills of Colorado. You have to love a riding discipline that makes a no-name horse so dynamic and strong. Disclaimer: My Dad passed away previously, and very recently my Mother had followed. I was reeling from a sad divorce and still unpacked in my new home. My boarding barn had sold and we were all scattering at the end of the month. And my 19-year-old dog had just been euthanized. It was the beginning of a mid-life crisis of gargantuan proportions. A lesser woman would have stayed in bed. Take a breath and enter at the canter. X/halt/salute, time stills and… goosebumps. Spirit felt wonderful. We were bold, the first movement was tempi changes. Spirit was forward and relaxed, the half-pass was smooth as skating on ice. My smile was so big that my lips stuck on the gums above my teeth. I felt beautiful. Spirit just got better, and time slowed enough for us to share that awareness. We finished with an extended canter down the center-line, snout to nose with the judge and halt/salute. As I dropped my reins, the tears started, quiet at first. Then the barking cry, you know the one. It involves gasping for air and choking on snot. Not the most elite exit, so it goes. Spirit wasn’t a perfect horse, and a thinking rider is always a work in progress. But anything is possible- and that day, we had that ride. I was walking very tall on the way back to the trailer. I wanted to scream I told you so! 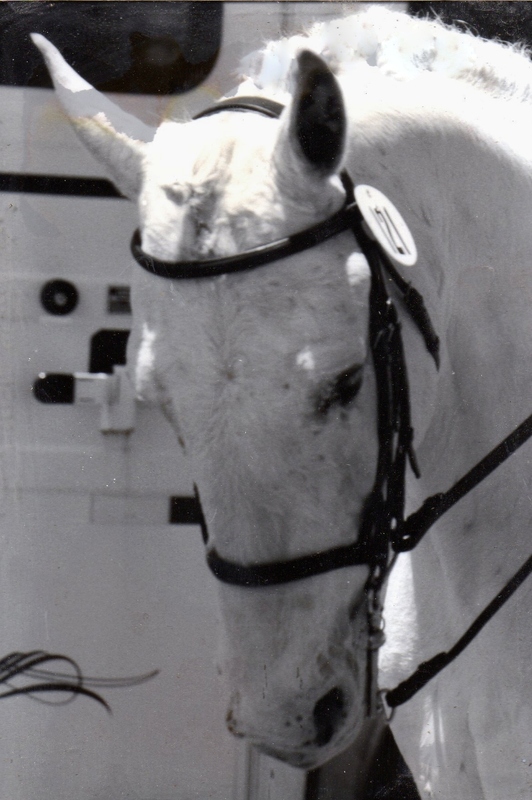 Our first year together, I had a few unplanned dismounts from Spirit, with a couple of injuries. People didn’t hesitate to tell me to sell Spirit. Right to my face. More than once. Now, for the perfect part: I haltered him and pulled his saddle. As I walked around behind him- I caught a toe, I think. But I didn’t fall really; it was more like I catapulted myself into the dirt. Launched into the earth, I hit with such velocity that people passing stopped to see if I was okay. When we stumble at 4th level, we have more forward and more collection, especially on the landing. I couldn’t breathe, there was blood on my white breeches, I was looking up through Spirit’s tail. Did I buck myself off my feet? When I could focus, I rolled my head to look up at Spirit. He looked back at me with curious ears. He didn’t stop chewing. Spirit was always happy to help humility find a balance with confidence. “It was the best of times, it was the worst of times, it was the age of wisdom, it was the age of foolishness, … we had everything before us, we had nothing before us, we were all going direct to heaven, we were all going direct the other way-“ Charles Dickens. We’re only human. It was a perfect day in a shared life. We didn’t know it was our last competitive ride. No one can tell the future. Bruised but not injured, lucky there. and I think you know the answer about winning… yes, everyday that I have him. Thanks for reading. Brilliant, Anna……really. I’m waiting to read the novel. I literally have chills. Tears on the edges of my eyes. This is such a beautiful hero’s story. The line, “A lesser woman would have stayed in bed.” POWERFUL. Thank you Anna. This story opened me to Spirit today. And a mighty fine hero he is! I’m looking forward to posts 3 and 4. Sounds like you and Spirit share a special bond. Is Spirit your granfather horse who had the late night medical emergency a few weeks back? I hope he is well and has a very happy birthday this month. Yes, Becky, he is my Grandfather horse…thanks for reading. I love your blog. Thank you for writing. Thank you so much for saying so! I love writing.